ART lovers are going mad for Antequera’s new state-of-the-art Museo de Arte de la Diputacion (MAD), which opened last week. A star-studded inauguration ceremony was cancelled due to Spain’s official mourning after the Barcelona-Dusseldorf crash. But the MAD has now opened its doors and is already creating a stir. 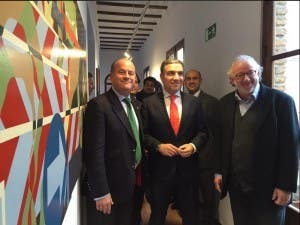 Housed in the palatial setting of the Casa Museo de los Colarte, the works exhibited are all owned by Malaga’s provincial government, the Diputacion. While the permanent collection comprises over 300 pieces spanning the 19th century to the present day, there are currently two temporary exhibitions: ´Cantos rodados’, based on El Torcal, and Joan Miro lithographs.